Integration with CipherLab's 1862 RFID Reader - CipherLab Co., Ltd.
Taipei, Taiwan - August 20, 2015 - CipherLab, a leading innovator in Automated Identification and Data Capture (AIDC) is delighted to present the 1862 handheld RFID reader to assist in smooth integration of RFID technology. Offering high level UHF reader options to extend RFID reading and writing, the 1862 also provides versatility in pairing with Bluetooth® devices to make operations simple. Users can also enjoy powerful software utilities that allow easy configuration for ultimate user friendliness. The 1862 is a device that has a long RFID reading range extending up to1 m (3.3 ft.) and 5 m (16.5 ft.) while the writing range extends up to 0.5 m (1.6 ft.) and 1.5 m (4.9 ft.) away. It also provides simultaneous EPC Gen 2 (ISO 18000-6C) tag readings so users can capture multiple tags at the same time. What sets the 1862 further apart from other typical RFID readers is its ability to give users extended RFID capabilities with existing mobile devices through Bluetooth® pairing. The 1862 handheld RFID reader is equipped with Bluetooth® V4.0 dual mode which is backward compatible with future along with existing smart devices. This will ultimately eliminate unnecessary high-cost replacements for the business. "The 1862 handheld RFID reader is a really efficient tool to integrate UHF technology into any business operations," Steven Liau, chairman of CipherLab informed, "With strong RFID reader option, users can achieve success quickly along versatile compatibilities with any Bluetooth® devices." The 1862 handheld RFID reader is also supplied with value-added software in EZSuite that provides multiple configurators which also make customization easy. These valuable configurators and customizing tools are all under the extensive protection of IP64 rating while being able to sustain multiple drops onto concrete from 1.5 m (5 ft.) plus 1,000 tumbles at 1 m (3 ft.). The 1862 ensures further continuous productivity with effortless one hand operation with a simple mount attachment. Users could enjoy a hassle free operation that provides high work efficiency. 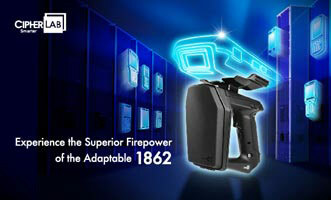 For more details and specifications regarding CipherLab 1862 or other CipherLab products, please visit www.cipherlab.com.